2015 was an important anniversary for local railways and this evening’s meeting promised to round if off in classic style. Members and railway enthusiasts formed an audience of over 80 people attending despite a day of extreme weather - torrential rain and high winds. Our speaker, Derek Brumhead, a familiar face to the Society, entertained the meeting with a detailed description of the proposed and actual railways which passed through Marple and New Mills. We learned about the various companies which, in the 19th century were in competition and how they tried to out do each other. The Wild West had nothing on New Mills in the 1860s. Looking at the proposals today some seem quite illogical – four different railway companies running trains to Hayfield! (right, train runs through Hayfield) Of course, many of the proposals were just that; they were designed as spoilers and were never built. Derek gave us lots of maps of railway lines to explain all this. That was just right for the enthusiasts but for some of us, it would have helped if each map had highlighted a building which can be seen today e.g. a church or a shop, so that we could get “our bearings”. would certainly encourage me to take a walk and discover more of the area in relation to the railways. 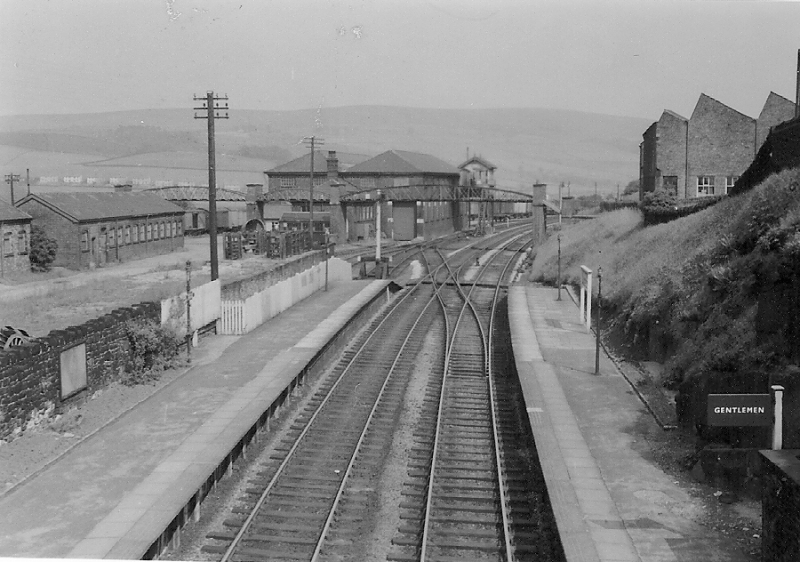 Of particular interest to some of us of a certain age was the image of New Mills Newtown (left) in the 1950s showed the siding and platform together with stables providing accommodation for 15 to 18 horses. This picture stirred a memory of what was happening in the 1950s. All local stations had such warehouses, these were important to the local community providing transport for passengers and the commercial importance of the movement of goods. The photographs of Hayfield Station in the 1950s, and the crowd of walkers arriving at Hayfield on a Ramblers’ Special in the 1930s (just as they were brought to Marple and the Roman Lakes) were very evocative. In the1930s there were 20 trains a day to Manchester/Return with over 100+ season tickets from Hayfield station. The station was demolished in the 1970s and the Visitors Centre in Hayfield is a historical reminder to visitors of the importance of the railway in Hayfield. Certainly Derek's talk gave food for thought, lots of information for railway enthusiasts and lots of memories of the local area. A fitting end to eighteen months of railway commemorations.